This is the second post in the series Cooking the Mediterranean Countries. You can read the first post with this link. Europe’s exploration of the world began in the 15th century and it was Portugal who pioneered what came to be known as the “Age of Discovery”. Portugal was the first to explore the Atlantic Ocean and the west coast of Africa and the first to colonize the Azores and other nearby islands. In 1488, Portuguese explorer, Bartholomew Dias, was the first to sail around the southern tip of Africa and in 1498 his countryman, Vasco da Gama, repeated the trip, making it as far as India. Portugal would establish ports as far west as Brazil, as far east as Japan and along the coasts of Africa, India and China. There were several reasons for the Portuguese to explore the world via the sea, but the overriding purpose was to discover a sea route around Africa to the east, with its rich promise of trade in valuable spices. When Ancel Keys and his team of researchers studied and characterized the Mediterranean diet and compared it with the eating habits of most of the developed countries during that time period, they identified it as the “Diet of the Poor”. According to Portuguese gastronomist, Maria de Lourdes Modesto and Keys, Portugal was included in their observations and studies, and Keys considered Portugal to have a pure “Mediterranean” diet. However, Salazar, the leader of Portugal at the time, did not want the name of Portugal included in the “diet of the poor”. 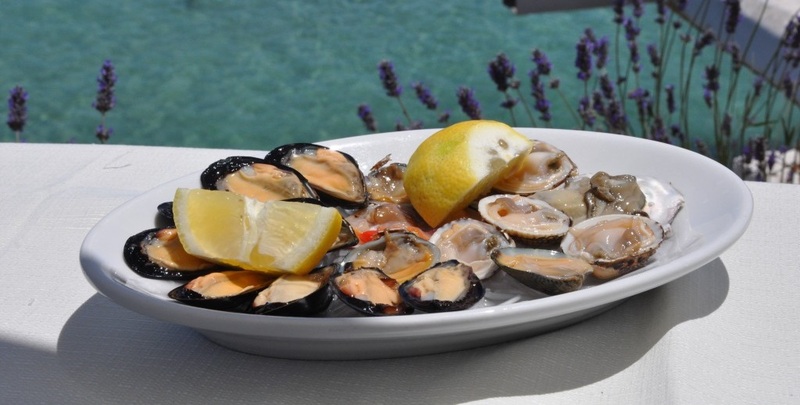 While Portugal’s shores are technically not on the Mediterranean Sea, the country is considered to have a typical Mediterranean diet. The basics of the Portuguese diet include vegetables, fruit, good quality bread, unprocessed cereals, dried and fresh legumes (beans, chickpeas, broad beans, etc. ), dried fruits and nuts (walnuts, almonds, chestnuts, raisins, etc. 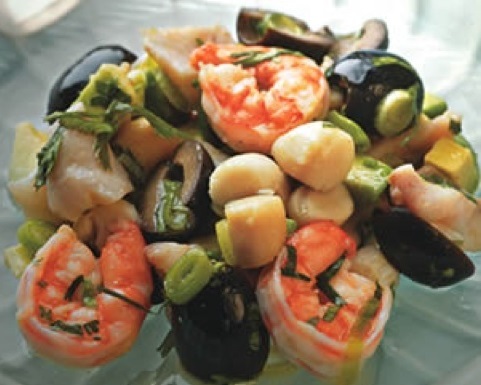 ), olive oil as the main source of fat and seafood instead of red meat. A Portuguese breakfast often consists of fresh bread, cheese or jam, accompanied with coffee, milk, tea or hot chocolate. A small espresso coffee (sometimes called a bica after the spout of the coffee machine) is a very popular breakfast beverage. 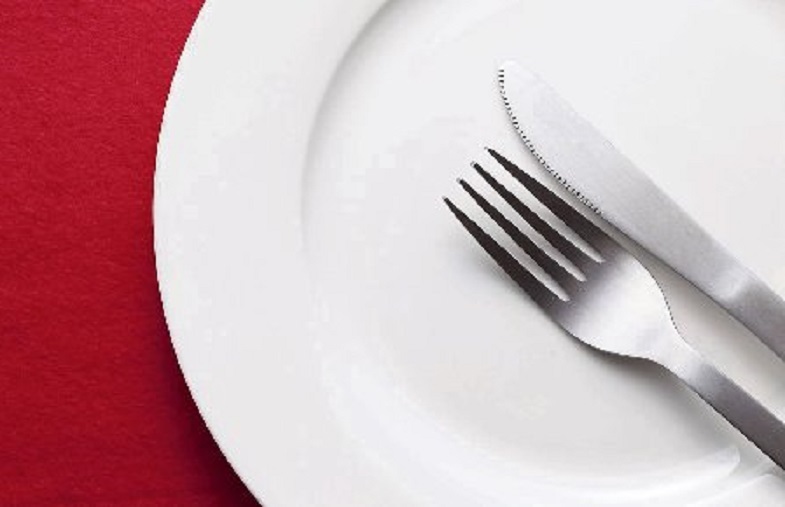 Lunch, often lasting over an hour, is served between noon and 2 o’clock or between 1 and 3 o’clock, and dinner is generally served late, around 8 o’clock in the evening. There are usually three main courses for lunch and dinner. Soup is usually the first course. A well-known Portuguese soup is caldo verde, which is made with potato, shredded cabbage and chunks of chouriço (a spicy Portuguese sausage) There are a wide variety of cheeses, usually made from the milk of sheep, goats or cows. The most famous are queijo da serra from the region of Serra da Estrela, Queijo São Jorge from the Portuguese island of São Jorge and Requeijão. Portugal is a seafaring nation with a well-developed fishing industry and this is reflected in the amount of fish and seafood eaten. The country has Europe’s highest fish consumption per capita. Fish is served grilled, boiled, poached, simmered, fried, stewed (often in clay pot), roasted or steamed. Cod is almost always used dried and salted because the Portuguese fishing tradition in the North Atlantic was developed before the invention of refrigeration. 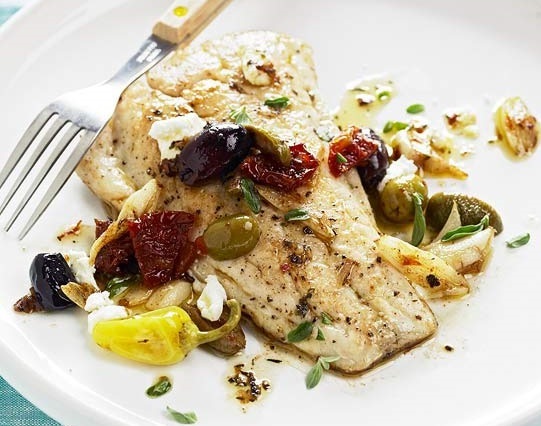 Simpler fish dishes are often flavored with extra virgin olive oil and white wine vinegar. Eating meat and poultry on a daily basis was historically a privilege of the upper classes and meat was not often on the Portuguese table. When meat is eaten it is often in a dish with other ingredients. A typical way Portuguese eat meat is in a dish is called cozido à portuguesa, which somewhat parallels the French pot au feu or the New England boiled dinner. Typical desserts include arroz doce (rice pudding decorated with cinnamon) and caramel custard. Portuguese stew is the perfect example of the importance of using all the meat an animal can provide. This stew can include beef, pork, chicken and a variety of pork derivatives such as blood sausages and smoked pork parts. The most traditional of Portuguese soups is simply: onions, potatoes and kale or cabbage, cooked with garlic and olive oil in a clay pot. This soup would normally be served with a slice of “linguica” ( smoked pork sausage) and cornbread (broa). These codfish fritters can be eaten as a starter or snack or along with rice and salad as a main dish. The fritters are made of shredded codfish, potatoes, eggs and parsley and cooked until crispy. Alheira is a type of Portuguese sausage made from meats that may include veal, chicken, duck and rabbit, compacted together with bread. If you have “alheira de caça” it means that it will only have game meat. This unusual sausage was created by the Jewish residents in Portugal when they were forced to convert to Christianity. Their religion wouldn’t allow them to eat pork but by preparing this sausage looking dish, they could easily fool others. The dish has become traditional throughout Portugal. Charcoal-grilled sardines are the most typical dish served in Lisbon. You can eat it in restaurants or from a street vendor during the Santo António festivities in June. They are most often served on top of a slice of cornbread, or with a roasted pepper salad or boiled vegetables. In a large pot put layers of onions, tomatoes, fish, peppers and potatoes. Continue to make layers until all the ingredients are used. Place the parsley, laurel leaf, saffron and salt on top. Add the wine, water and olive oil. Bring to a simmer over low heat and cook for about 45 minutes. Shake the pan once in a while. DO NOT STIR, just shake the pan. In a large pan heat the oil and fry the chouriço until lightly browned. Add the leeks, chili, bay leaf and garlic and saute for 3 minutes. Add the wine, diced tomatoes and bay leaf and bring to a boil. Add the clams cover the pan and steam for 5 minutes until all the clams are opened. Throw out any that do not open. Garnish with lemons and parsley. Serve with bread to soak up the juices. Grind cornmeal to a powder in a food processor. You may skip this step, but the bread will not be as smooth. Mix 1 cup of powdered cornmeal, salt and water until smooth. Add olive oil and cool to lukewarm. Blend in the yeast. Gradually add the remaining cornmeal and 1 1/2 cups of bread flour, mixing constantly. Add more flour if the dough is still sticky. Knead until firm. Let rise in a greased bowl until double in volume. Shape into round loaf and let rise until double. Bake at 350 degree Fs for about 30 to 40 minutes. Preheat a barbecue or broiler until hot. Make the parsley sauce in a bowl by whisking together the oil, vinegar, onion, parsley, capers and garlic. Set aside. Season the fish with garlic, lemon juice, salt and pepper and brush or drizzle with oil. Grill or broil the fish for five minutes on each side. Transfer to a heated platter, spread with parsley sauce and serve. Place the water, salt and lemon peel into a medium pan and bring to a boil. Reduce the heat to low and allow the water to simmer with a lid on for about 15 minutes. Remove the lemon peel from the water with a slotted spoon and discard. Add the rice to the water and bring it back up to a boil. Then reduce it to a simmer and allow the rice to absorb all of the water (about 10 minutes). Slowly add the hot milk, about 1/2 cup at a time, to the rice mixture. After each addition, allow the liquid to be absorbed before adding the next batch of milk. 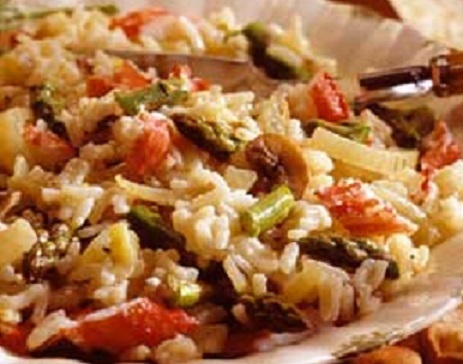 Stir frequently and keep the heat at low, so that the rice does not burn at the bottom of the pan. This should take about 25 to 30 minutes. Pour the rice into a serving dish. Sprinkle the top with the cinnamon. Need Some New Dinner Ideas? Are you bored from eating the same things for dinner week after week? One of the best ways to add variety and interest to your meals is to experiment with ingredients you haven’t used before or use your favorites in a new way. Add different seasonings and herbs to change your old recipes. Try new combinations of ingredients. Hopefully, the recipes below will inspire you. Serve this entrée with cooked orzo pasta or couscous and sautéed green beans. Peel the garlic cloves and with the side of a wide knife smash garlic. Drain 2 tablespoons of oil from the sun dried tomatoes and heat the oil in extra-large skillet. Add sun dried tomatoes, olives and garlic to the hot oil. Cook 2 to 3 minutes, until garlic is golden. Use a slotted spoon to the remove the tomato-olive mixture. Leave the oil in the skillet to cook the fish. Set aside the tomato-olive mixture. Rinse and pat fish dry with paper towels. Season with salt and pepper. Cook fish, skin side down, in the hot oil 5 minutes for each 1/2 inch thickness of fish or until the skin is golden and crisp and the fish flakes easily when tested with a fork, turning once halfway through cooking. Remove skin, if desired. 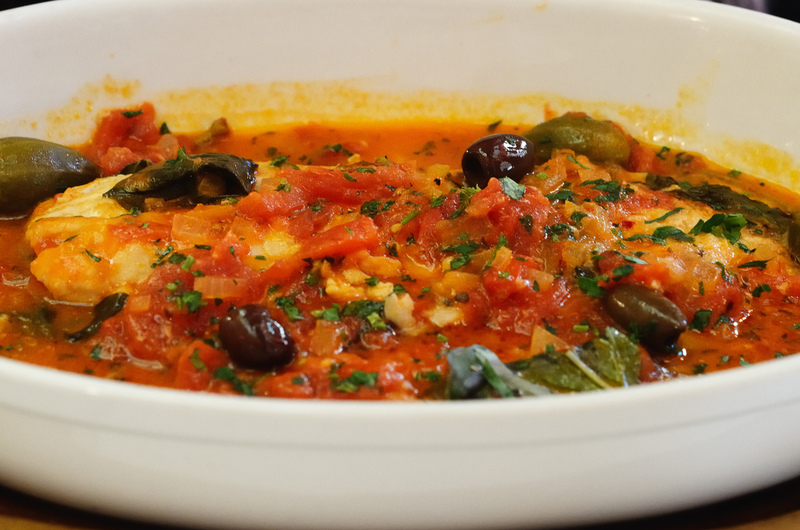 To serve, top fish with tomato-olive mixture, cheese, chopped fresh oregano and pepperoncini. 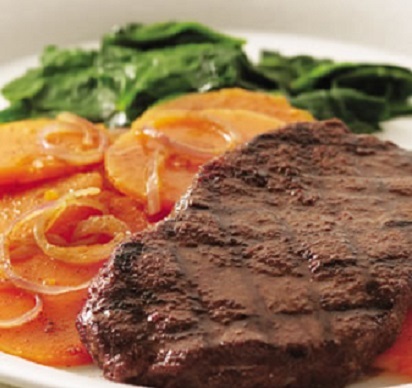 Cook the sweet potatoes and onions in a foil packet alongside the steak on the grill. Serve with steamed fresh spinach. Preheat grill to high and oil the grates. Combine allspice, cumin, ginger, salt, cinnamon, coriander and cayenne in a medium bowl. Remove 2 1/4 teaspoons for the steak. Sprinkle the steaks with 2 1/4 teaspoons of the spice mixture. Add the sliced sweet potato and onion to the bowl with the remaining spice mixture along with the oil and orange zest; toss to coat. Place two 24-inch sheets of foil on top of each other (the double layers will help protect the ingredients from burning). Generously coat the top piece with cooking spray. Spread the sweet potato mixture in the center of the foil in a thin layer. Bring the short ends of foil together, fold over and pinch to seal. Pinch the seams together along the sides to seal the packet. Place the packet on one side of the grill and cook, turning once, about 6 minutes per side. Cook the steaks on the other side of the grill, turning once, 3 to 4 minutes per side for medium-rare. Transfer to serving plates and let rest while the foil packets finish cooking. Open the packets (be careful of steam) and serve alongside the steaks with steamed spinach. Serve this dish with a mixed green salad and crusty Italian bread. In a large bowl, mix the tomatoes with the basil, parsley, garlic, salt, chili and olive oil. 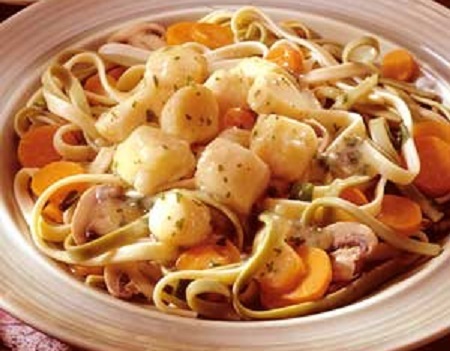 In a large pot of boiling salted water, cook the linguine until al dente; drain well. 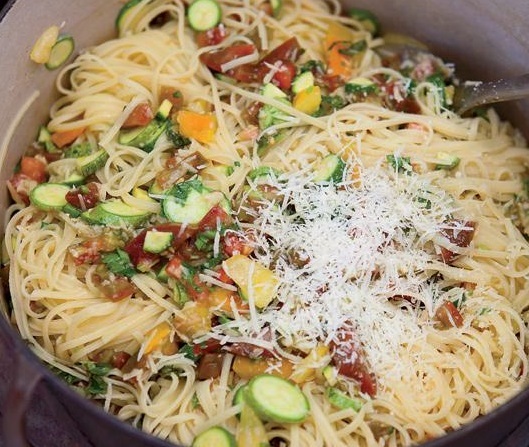 Add the linguine to the bowl with the tomato mixture along with the sliced zucchini and toss. Add the 1/4 cup of grated cheese, toss again and serve in pasta bowls, passing more cheese at the table. Whisk lemon juice, olive oil, mustard, honey and dill in a medium bowl. 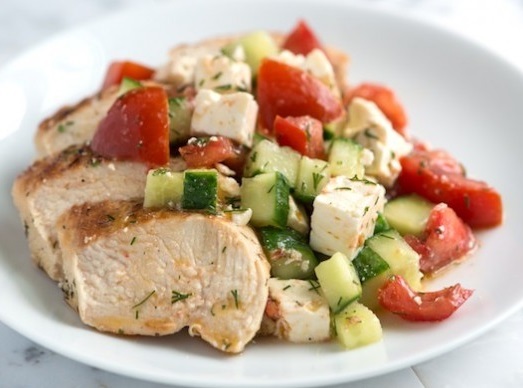 Add tomatoes, cucumber and feta cheese. Toss gently, season to taste with salt and pepper. Refrigerate at least 20 minutes or up to a day. Combine lemon juice, olive oil, garlic, dill, salt and pepper in a small bowl. Use the back of a small spoon to press garlic and dill into the other ingredients. Pour the marinade into a resealable plastic bag or small rimmed dish and add the chicken. Marinate 20 to 30 minutes at room temperature or up to 2 hours in the refrigerator. Remove the chicken from the marinade and discard the marinade. Heat 2 tablespoons of olive oil in a medium frying pan (with lid) over medium-high heat. As soon as the oil is hot, add the chicken. Cook 2 to 3 minutes until golden. Turn, reduce heat to low, then cover the pan with the lid. Cook 10 to 15 minutes or until an instant read thermometer reads 165 degrees F (74C) when inserted into the thickest part of the breast. Transfer chicken to a plate and cover loosely with aluminum foil. Rest 5 minutes. Serve alongside the salad. Serve this dish with your favorite coleslaw or use the recipe below. Heat a gas or charcoal grill and oil the grill grates. In a 1-quart saucepan, heat marmalade, rosemary and salt to boiling, stirring frequently. Remove from heat; set aside. In a 1-quart microwavable bowl, place sweet potato pieces and water. Cover loosely with a microwavable paper towel. Microwave on High 2 to 3 minutes, stirring once, just until potatoes are tender (do not overcook). Drain sweet potatoes and pat dry with a paper towel. 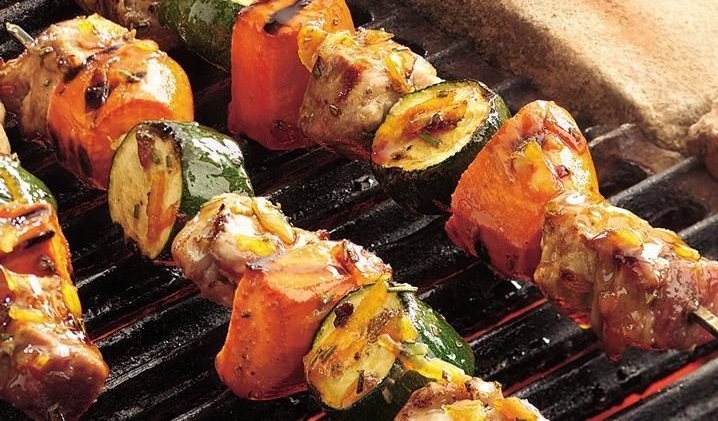 On each of eight 12 inch long metal skewers, carefully thread pork, sweet potatoes and zucchini, leaving 1/4-inch space between each piece. Grill kabobs over medium heat 8 to 10 minutes or until the until pork is cooked., turning once and brushing with the marmalade glaze during the last 3 minutes. 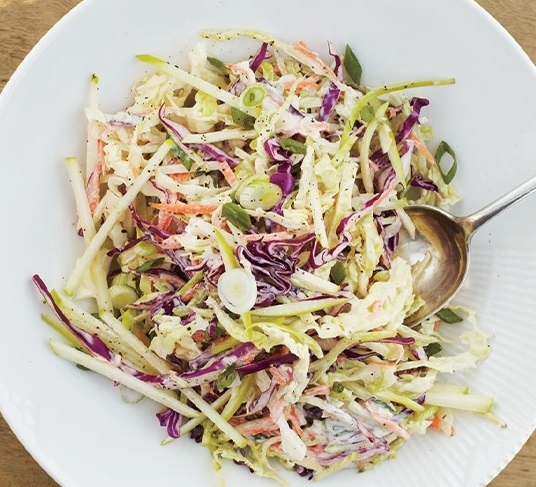 This coleslaw is very refreshing with BBQ foods. It keeps well, covered in the refrigerator and should be made several hours in advance to allow the flavors to develop and the cabbage to soften. In a glass measuring cup, combine Greek yogurt, vinegar, honey, salt and pepper and whisk until smooth and thoroughly combined. Place slaw in a large bowl and pour the dressing mixture over the top. Stir to coat cabbage thoroughly. Cover and refrigerate for at least 30 minutes. Fish has a high level of protein, is easy to digest and is considered an important part of a healthy diet. Some fish have an added bonus because they contain omega-3 fatty acids. These fatty acids – docosahexaeonic acid (DHA) – occur mostly in fatty fish like herring, salmon and mackerel. They are thought to lower blood pressure, to strengthen the immune system and to have positive effects on the development of the nervous system and the cardiovascular system. Two newly published articles in the March 2013 science journal, Proceedings of the National Academy of Sciences, describe how the researchers analyzed the impact of omega-3 fatty acids at a systemic level and they also described their underlying molecular mechanisms for the first time. The teams working at Jena University Hospital in Germany and at the University of Pennsylvania examined the effects of omega-3 fatty acids on the cardiovascular system and were able to show, for the first time, that DHA directly influences blood pressure. According to the Mayo Clinic, Omega-3 fatty acids may decrease triglycerides, lower blood pressure, reduce blood clotting, boost immunity and improve arthritis symptoms and, in children, may improve learning ability. Eating two servings a week of fish, particularly fish that’s rich in omega-3 fatty acids, appears to reduce the risk of heart disease and sudden cardiac death. Fatty fish, such as salmon, herring and tuna, contain the most omega-3 fatty acids and, therefore, offer the most benefit, but many types of seafood contain small amounts of omega-3 fatty acids. Most freshwater fish have less omega-3 fatty acids than do fatty saltwater fish. However, some varieties of freshwater trout have relatively high levels of omega-3 fatty acids. Only buy fish that is refrigerated or properly iced. Fresh fish should smell fresh and mild, not fishy, sour or ammonia-like. Whole fish and fillets should have firm, shiny flesh and bright red gills free from slime. When buying frozen fish, avoid packages placed above the frost line or top of the freezer case. If the package is transparent, look for signs of frost or ice crystals. These could mean the fish has been stored a long time or thawed and refrozen — in which case, choose another package. Baking fish allows you to get the satisfying crunch of fried fish without all the fat. Just because it’s baked, though, doesn’t mean it’s healthy: Watch the amount of butter, oil, mayonnaise, or cheese called for in the recipe. It’s easy and delicious to cook fish fillets in packets of parchment paper, a technique called “en papillote”. The fish is cooked by the trapped steam. If you don’t have parchment paper on hand, use aluminum foil to make the packets. The fish needs to bake for only 10 to 15 minutes at 400 degrees F.
When the weather’s not right for grilling, try broiling instead. 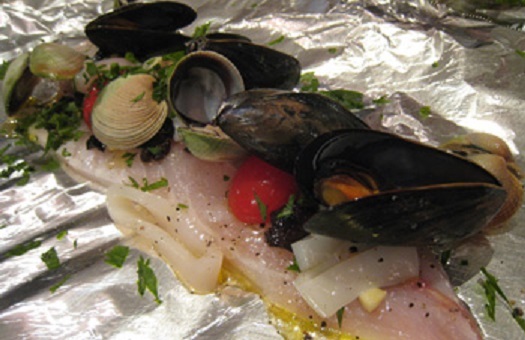 Broiling is great when you want a fast, simple, hassle-free preparation with delicious results. It gives fish a nicely browned exterior with the convenience of a temperature-controlled heat source. For easy cleanup, line the broiler pan with a piece of greased foil. This gentle cooking method is perfect for seafood. Poaching keeps fish moist and won’t mask the delicate flavor of the fish. To poach fish: use vegetable or chicken stock or a homemade broth of aromatic herbs and spices. Use a pan big enough to lay each piece of fish down flat. Pour in enough liquid to just barely cover the fish. Bring the liquid to a simmer and keep it there. If you see any bubbles coming up from the bottom of the pan, it’s too hot–the liquid should “shimmer” rather than bubble. The ideal poaching liquid temperature is between 165 and 180 degrees F (74 to 82 degrees C). Steaming is another gentle cooking method. It produces a mild-tasting fish that is often paired with a flavorful sauce. Rub the fish with spices, chopped herbs, ginger, garlic and chili peppers to infuse flavor while it cooks. Use a bamboo steamer or a folding steamer basket with enough room for each piece of fish to lie flat. Pour about 1½ inches of water into the pan. Place the steamer over the water, cover the pot, and bring the water to a boil. Begin checking the fish for doneness after 10 minutes. When you’re grilling fish, keep a close watch. Fish only takes a few minutes per side to cook. If the fillets are an even thickness, they may not even require turning–they can be cooked through by grilling on one side only. 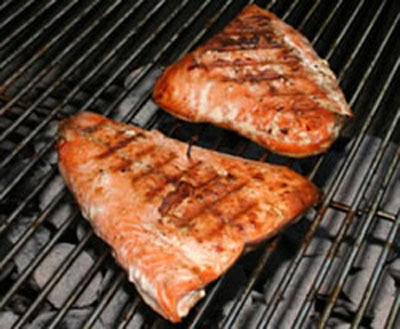 Brush the fish lightly with oil and spray the grill with nonstick cooking spray. Place fish near the edge of the grill, away from the hottest part of the fire. (Don’t try to lift up the fish right away; it will be stuck to the grill). Turn the fish over when you see light grill marks forming. Fish should be cooked to an internal temperature of 145 degrees F. If you don’t have a food thermometer, you can determine whether fish is properly cooked by slipping the point of a sharp knife into the flesh and pulling it aside. The flesh should be opaque and separate easily. This dish makes a great appetizer. Scrub the clams and rinse them in four rounds of cold water to remove any sand and grit. Heat a 12-inch skillet with a cover over medium-high heat and add the olive oil. Add the garlic and shallots and sauté until fragrant and tender, about 1 minute. Add the wine and cook for about 1 minute more. Add the clams and cook covered until the clams open wide, 5 to 10 minutes, stirring every few minutes. Add the 2 tablespoons butter, the parsley and season with pepper. Toast the bread on a stovetop grill or in the broiler about 1 minute, turning once. Discard any unopened clams and serve right away in bowls with the bread and pan juices. This is another great appetizer. 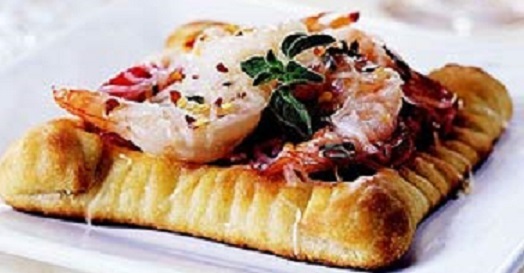 You can turn it into a main dish by serving the shrimp and sauce over rice or pasta. The sauce is also delicious spooned over grilled swordfish or any other meaty fish. On a cutting board, finely chop the drained capers with the oregano and garlic. Transfer the mixture to a bowl and stir in 1/2 cup plus 2 tablespoons of the olive oil, along with the lemon zest and lemon juice. Season the sauce with pepper. Heat a stove top grill. In a large bowl, toss the shrimp with the remaining 2 tablespoons of olive oil and season lightly with salt and pepper. Grill shrimp, turning once, until the shrimp show grill marks and are cooked through, about 3 minutes per side. Remove the shrimp to a platter. Spoon some the sauce on top and serve. Pass the remaining sauce with the shrimp platter. MAKE AHEAD The sauce can be refrigerated overnight. Bring it to room temperature before serving. Serve with crusty bread. Serve with rice or couscous and a salad or steamed broccoli. In a medium saucepan, heat olive oil and saute onion until tender, about 5 minutes. Add garlic and saute for 1 minute. Stir in marinara sauce, wine, capers, black olives, red pepper flakes and parsley. Bring to a boil and simmer for 10 minutes. Spread 1/2 cup of the sauce in an 11 x 7 inch baking dish and arrange the snapper fillets in a single layer in the dish. Pour the remaining sauce over all. Bake for 15 minutes for 1/2 inch thick fillets or 30 minutes for 1 inch thick fillets. Baste once with the sauce while baking. Snapper is done when it flakes easily with a fork. Preheat the oven to 400°F. Coat a 9-by-13-inch baking dish with cooking spray. Mix the stuffing ingredients together in a medium bowl. Working with one piece of salmon at a time, spread about 3 tablespoons of the breadcrumb mixture over the salmon. Starting at one end, roll the salmon up tightly, tucking in any loose filling as you go. Insert a toothpick through the end to keep the rolls from unrolling. Place in the prepared dish and repeat with the remaining salmon strips. Bake the rolls until just cooked through, 15 to 20 minutes. Remove the toothpicks before serving. Fregola, the pearl-sized pasta that is similar to couscous, makes an excellent substitute for rice in this paella-style dish; it soaks up a lot of the cooking liquid from the dish and still stays chewy. In a small bowl, crumble the saffron in 1/2 cup of the warm water and let stand for 10 minutes. Meanwhile, heat the olive oil in a very large, deep sauté pan. Add the onion and garlic and cook over high heat, stirring, until lightly browned, 2 minutes. Add the fregola and sausage and cook, stirring, until the sausage starts to brown, about 2 minutes. Add the tomatoes, white wine, saffron and its soaking liquid and the remaining 6 cups of warm water to the sauté pan and bring to a boil. Stir in 1 1/2 teaspoons of salt and 1/2 teaspoon of black pepper, cover and cook over low heat until the fregola is very chewy and soupy, about 10 minutes. Season the shrimp and red snapper with salt and pepper and add them to the pan along with the mussels, nestling them into the fregola. Bring to a boil. Cover the pan and cook over low heat until the fregola is al dente, the fish is just cooked through and the mussels have opened, about 12 minutes longer. Remove the pan from the heat and let the paella stand for 5 minutes; the fregola will absorb a bit more of the liquid, but the dish should still be brothy. Discard any mussels that do not open. Sprinkle the fregola with the chopped parsley and serve.